Did you watch a movie almost halfway through just to realize that you have already watched it earlier? Do you remember all the movies you have watched so far? If not, you can make a movie list to know if you watched a movie or not. Even if none of these things apply to you, you can still use lists to keep track of all the movies you watched and share them with others. In this article, I compiled a list of 4 free websites to keep track of watched movies. On these websites, you can create lists of movies you have already watched and movies you are planning to watch. You can quickly search a movie by name and add that to your list. Some of these websites multiple methods to add movies to your list, including bulk import via IMDb URLs or CSV file. Apart from maintaining lists, you can follow other users, share lists, and discover new movies. So, let’s check these websites in details. 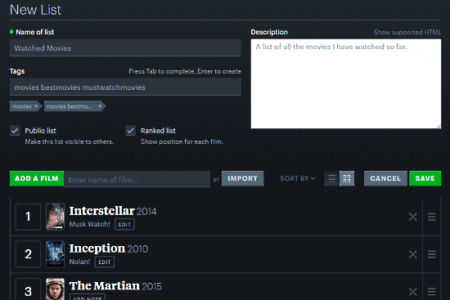 Letterboxd is a free website to keep track of all the movies you have watched and planning to watch. It’s basically a social network for film discussion and discovery. To use this website, you have to create an account first. After creating the account, you can manage the movies in different lists. 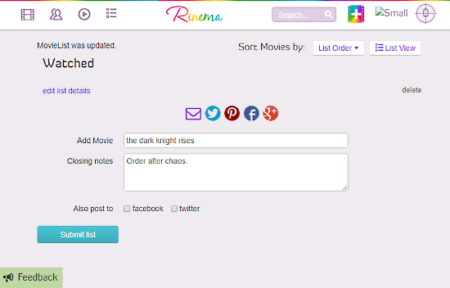 You can create a list with custom name, add tags and description, make the list public/private, and ranked the movies. In a list, you can add movies one by one by searching them by names or import movie list from a CSV file. If you have a well-managed and updated IMDB account, you can import your movie list from there as well. In the list, you can re-arrange movies in any order you like. You can simply move a movie up or down in the list to change its rank. This website also gives you an option to add a note along with each movie. After making the list, you can save it to your Letterboxd account. Then, you can visit this list and mark the movies which you have seen. This way, you can also add movies which you are planning to see in the future and keep the list updated by marking them watched when done. You can share your movie list with others and access public movie lists as well. From a public list, you can add movies to your watchlist or any other list. You can also follow people to create a network, rate movies, and write reviews. keep track of movies watched with Letterboxd here. Criticker is an online community of people where you can rate movies, write reviews, create public and private collections. The main goal of this website is to help you find people with similar taste in movies. On this website, you can find thousands of public movie collections which you can browse and critic. While browsing a collection, you can save a movie for later or add that to your collection(s). You can also search a movie by its name and add that to your collections. In the search results, this website shows you details about that movie along with options to add rating and review. Alongside the movie, there is an information box where you can get the rating from various sources, find the movie-related product on eBay, browse public collections in which that movie currently is, and get ranking stat info. On this website, you can create public and private collections, separately. For each collection, it shows you the movies in that collection, updated date, seen movies, average, and stars given. 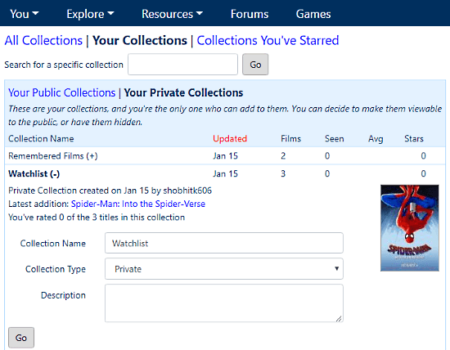 Other people on Critcker can access your public collections whereas the private collections are for your eyes only. Give Criticker a try here to keep track of watched movies. iCheckMovies is another free website to keep track of watched movies. This website is also like a social media for movies. Here, you can connect with other users, create groups, add friends and neighbors. On this website, you can create movie list and set the visibility to public, friend, or private and choose a category. Then, you can add movies to your list either by searching by name or via IMDb URL. You can also add movies in bulk. For that, you can either enter an IMDb movie list URL or upload a CSV file. With the free membership, you can add up to 5000 movies in your collections. You can share your collections with friends and via links by making those public. You can also compare your profile with other users and check your mutual compatibility. Manage watched movies lists with iCheckMovies here. Rinema is yet another free social media platform for movies. On this website, you can create an account either by an email or sign up using Twitter or Facebook. Once you create the account, Rinema asks you to rate at least 20 movies to understand your movie taste. Then, in then the next step, it lists other users with common interests where you can connect with them. After going through the initial setup, you can browse movie lists on this website and create your own as well. To create a list, you have to enter a list name along with a description. After that, you can start adding movies to the list. You can search for a movie and add that to the list along with a closing note. 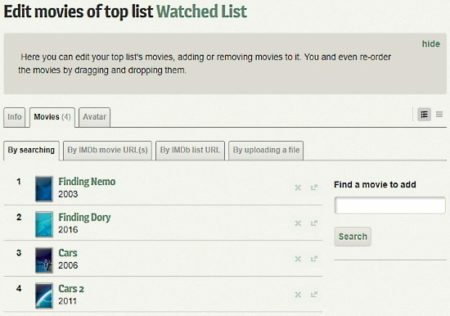 You can also add movies to the list while browsing other lists and movies. After making the list, you can share with your Rinema contact and also share it to Facebook and Twitter. These are the 4 free websites to keep a track of watched movies. All these websites basically have the same basic functionality with additional features on top. Check them all out and lets us know which one you find best to keep track of your movies.